Wash, peel & thinly slice the potato. Place it in a small pot filled with about a cup of cold water. Add a pinch of salt. Boil the potato slices for 5 minutes – don’t overcook them. You don’t wanna end up with mashed potatoes instead. Preheat the oven to 230C/450F. Wash and chop the parsley. Finely or roughly – any way you like. Peel and dice the onion. Make pizza sauce (have a look at my Pizza Sauce Recipe) or open your favorite pizza sauce bottle/jar. Drain the potatoes. Let them cool down. Roll out your dough. Place it on a baking tray lined with baking paper. Top with pizza sauce of your choice (I suggest to put a bit more than you are used to for the extra bit of flavor), cooked sliced potatoes and finish off with diced onion. Bake at 230C/450F for 12-15 minutes. Take out. Garnish with chopped parsley and a drizzle of extra virgin olive oil. 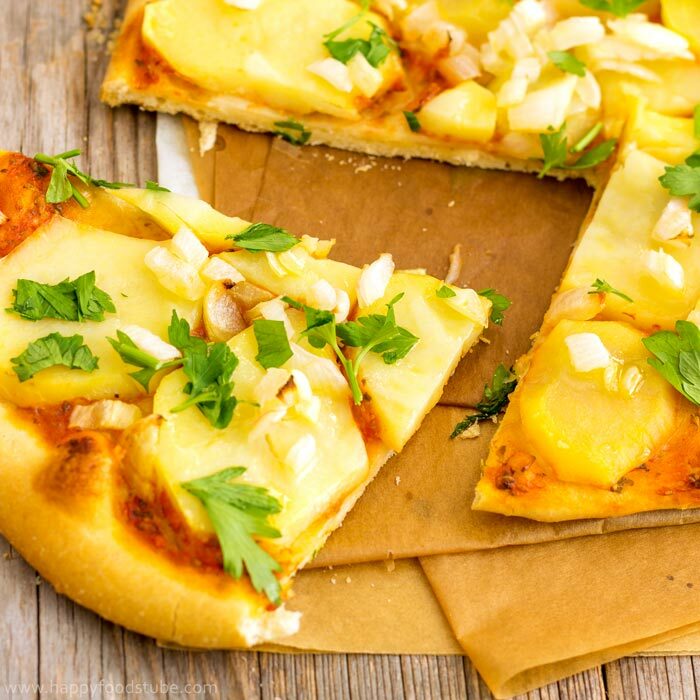 This homemade vegan potato pizza is loaded with simple yet flavorful ingredients! 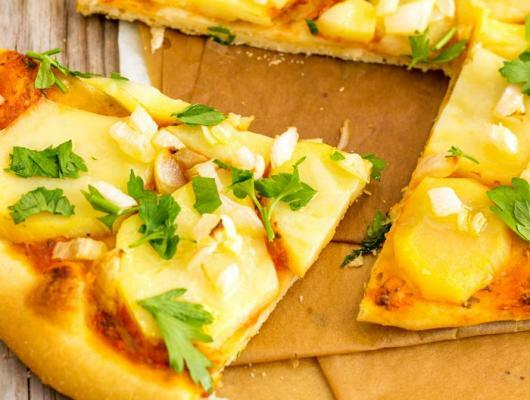 Delicious & healthier version of the classic cheesy pizza.